How to build Image components – How can we help you today? Overview Each Image component lets you display a single image in a Klip. With the Layout Grid component, you can arrange multiple Image components in a single Klip. Individual images can be customized according to your preferences. The image can come from a URL, XML/JSON data source or an RSS feed. The Image component lets you display a single image in a Klip on your dashboard. With the Layout Grid component, you can arrange multiple Image components in a single Klip. Custom settings control how each image is displayed. This component is also useful for data feeds like traffic cameras or webcams. Note that many component types support using Image URLs. 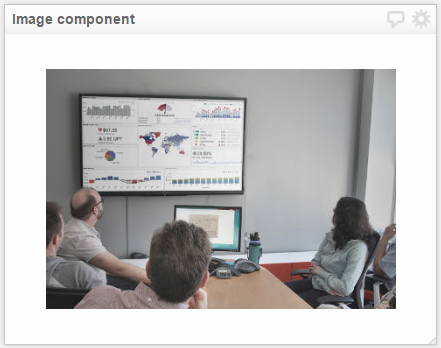 Click Image in the component hierarchy and select the Data tab. Either select Insert Literal String or number and type a URL or select Insert data from a data source and select a URL from a data source. See Image URLs for more details. This section provides examples of different ways to use the Image component. You can use the Properties tab to customize the height, width and position of an image. Component Height: Specify a height for the Image component. Options include from Small to Very Large, or Custom. Select a resize option for the image. This option forces the entire image to display using its native dimensions. This often results in the image being cut off horizontally, if the width of the image is greater than the available horizontal space. If the component height is set to anything but Auto, the image may also be cut off vertically. This option sets the image to the dimensions specified, in pixels. Aspect ratio is not maintained, if both dimensions are set to custom values. This option forces the entire image to display within the Image component dimensions. If the component height is not set to Auto, the component may have empty space above and/or below the image, or to either of both sides - depending on the alignment settings. This option resizes the image to fill the component, so there is no empty space. If the component height is Auto, this setting will show the entire image. If the component has a specified height, the side effect is that parts of the image may be cut off. Align: Specify how the image is aligned by selecting left, center, top, and bottom. If parts of the image are cut off due to other settings, alignment settings may show different parts of the image in the Image component. Auto-Update: Setting an Auto-Update rate will force the component to re-download the image at the rate you choose from Never to Every 60 minutes. For an image within a Layout Grid component, you can also use the Layout tab to span an image across one or more cells and set padding options. Click Image in the component hierarchy and select the Layout tab. Specify whether to span the image across one or more columns or rows. Customize cell width and height by specifying a number in pixels. For example, 250 px. Specify cell alignment by selecting top, center or bottom. Specify the amount of whitespace around a cell by setting Cell Padding in pixels for all sides or individually for top, left, bottom and right.